This blog post draws on data and research discussed in our entry on World Population Growth. UPDATE: On September 20 and again on October 7 I have updated the World Population Cartogram and made a number of minor changes. The Japanese translation of this blog post is here:グローバルな生活条件がどのように変化しているのかを私たちが考えようとするときに必要な地図. Our mission here at Our World in Data is to show how living conditions around the world are changing. To show global data it is convenient to use a map. But despite the popularity and familiarity of world maps, they can mislead our understanding of how living conditions around the world are changing. They are made for a different purpose; geographical maps show us where the world’s land masses are and where country borders run. They don’t show us where the people are. If we want to show where the world’s people are we need a population cartogram, a geographical presentation of the world where the size of the countries are not drawn according to the distribution of land, but according to the distribution of people. So I spent the last few weekends making this cartogram for the world population in 2018. As the size of the population rather than the size of the territory is shown in this map you can see some big differences when you compare it to the standard geographical map we&apos;re most familiar with. Small countries with a high population density increase in size in this cartogram relative to the world maps we are used to – look at Bangladesh, Taiwan, or the Netherlands. Large countries with a small population shrink in size – talking about you Canada, Mongolia, Australia, and Russia. We should keep this cartogram in mind when we are looking at charts that show country-by-country data, because we have to remember that the number of people that these charts speak about is very different from one country to the next: An increase of the life expectancy in Denmark means that the average health of 5.8 million people is increasing, while an increase for India means that the health of 1,354 million people is improving. And a line chart that shows improvements in all African countries or across all of the American countries refers to fewer people than a chart with a single line that shows an improvement in China. The two largest countries in Asia – China or India – are the home of more people than any other entire continent. 13 countries in the world are home to more than 100 million people: China (1.415 billion), India (1.354 billion), United States (326.8m), Indonesia (266.8m), Brazil (210.9m), Pakistan (200.8m), Nigeria (195.9m), Bangladesh (166.4m), Russia (144m), Mexico (130.8m), Japan (127.2m), Ethiopia (107.5m), Philippines (106.5m). A 14th country is very close though, Egypt is expected to reach 100 million next year. Together these 13 countries are the home of 4.75 billion people, 62% of the world population. The cartogram below focusses on Asia and Oceania where 6 out of 10 people in the world live. Within this world region the population is very unequally distributed. South-East Asia is densely populated while large countries such as Mongolia, Australia, Kazakhstan, and the Asian part of Russia are home to relatively few people. And again within countries we see a very high concentration. The metropolitan area of Beijing has the same population as all of Australia. Tokyo’s population almost equals the population of all of Oceania. More than a third of the world population – 36.2% – live in India and China. Today, both India and China have a larger population than the entire world population in 1850 (when the world population was around 1.26 billion people). But while China and India dominate, other Asian countries are also very populous: Seven of the world’s 13 countries with more than 100 million inhabitants are in Asia. Population growth in Asia has been rapid in the last decades: The population of Asia has tripled in size since 1950. And while some countries in Asia have already reached the last stage of the demographic transition some others still have rapid population growth ahead. The fertility rate in India has fallen from 6 children per woman in the 1960s to 2.35 children today, but population momentum means that population growth will continue for another 4 decades. According to the UN&apos;s population projection the population of India is expected to reach 1.68 billion in 2060 and the country is then expected to be the most populous country in the world. The population of the Americas is roughly one billion (1.015 billion). 428 million live in South America and 587 are at home in North America, Central America, and the Caribbean. The USA – the third most populous country in the world – is by far the most populous country on the American continent. Its population is roughly as large as the population of the two runner-ups – Brazil and Mexico – combined. Canada has a population density of just 4 people per km² – in the cartogram the second largest country in world (by area) is reduced to not much more than a slim line of squares. The shape of the South American countries stays similar to what we would see on a geographical map. This is because the population density across the different South American countries is relatively similar. The population of the American continent has increased very rapidly over the course of the last few generations. Historical estimates suggest that in 1820 the population was only around 35.5 million. At the time this made up just 3.4% of the world population. 1-in-6 people in the world live in Africa. The second most-populous continent is home to almost 1.3 billion people. 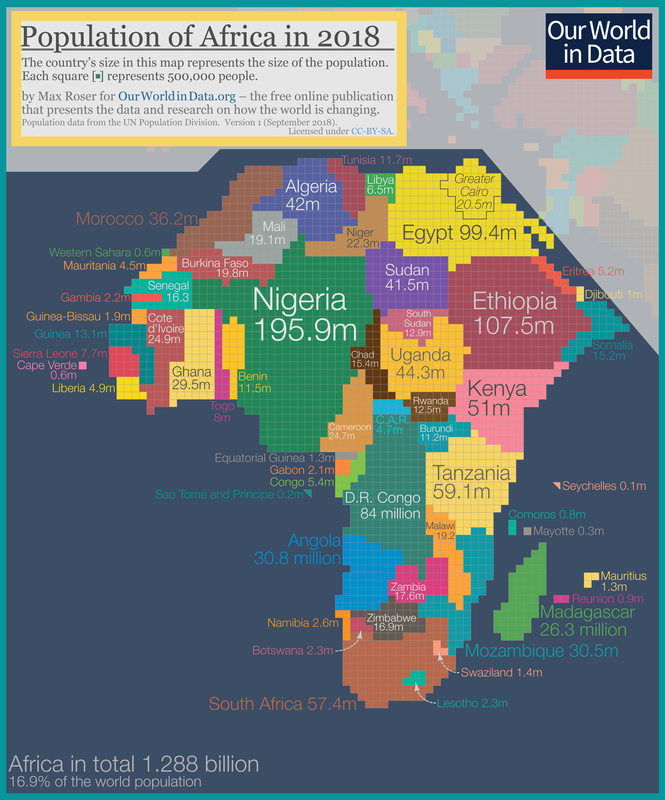 Two countries have a population of more than 100 million: Nigeria with 195.9 million and Ethiopia with 107.5 million. 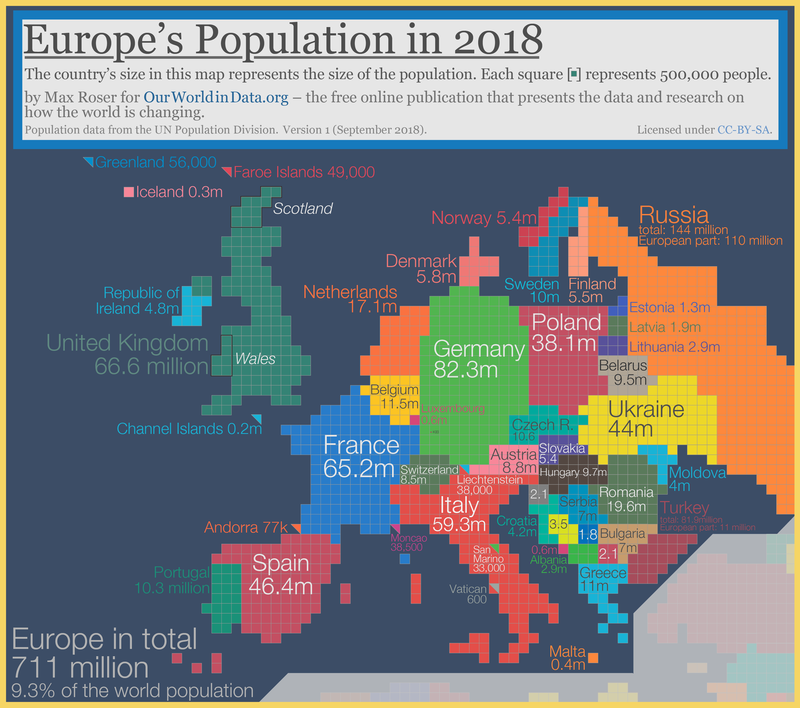 Five European countries have a population that is larger than 50 million: The European part of Russia (110 million), Germany (82.3 m), the UK (66.6m), France (65.2), and Italy (59.3m). Some regions of Europe are very densely populated. The Netherlands has a population density of 505 people per km² (compared, for example, to the US with 35 people per km² – see below for the map). The population of China is almost exactly twice as large as the population of Europe. Another way to show where the world population lives is to show the population density of each country on a geographical world map, as you see below. The world&apos;s densely populated countries in Middle America, Europe, and South East Asia stand out – Bangladesh is the most densely-populated large country in the world, with 1,252 people per square kilometer. If you hover the mouse on the bracket from 0 to 10 on the legend then you see the world&apos;s least densely populated countries. 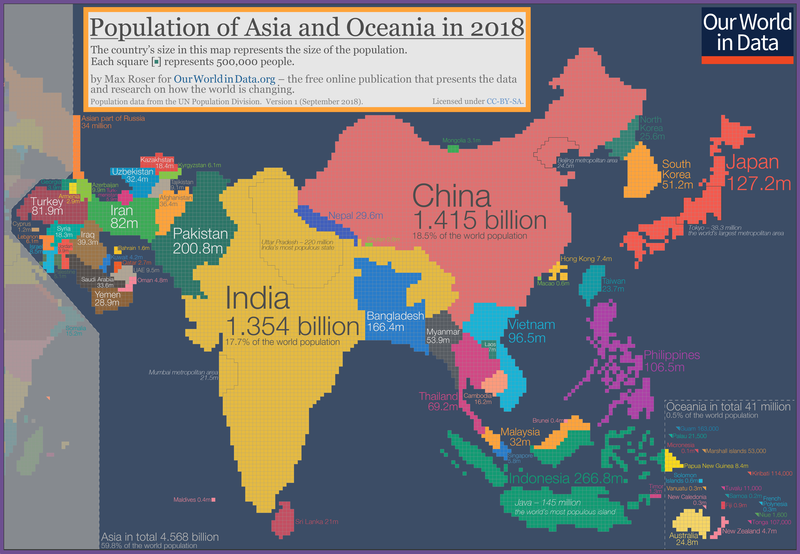 If you are interested in what is happening to the world population and you are following our work on Our World in Data, I hope these cartograms are helpful to you. If you want to print it you can get it in high resolution here. The 2018 data is a future projection that the UN Population Division created last year. Other data – the US in 1776, the population of various metropolitan areas, and the population of some small countries – are mostly from Wikipedia. 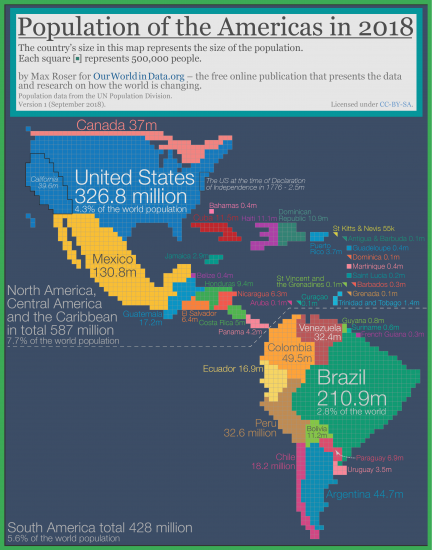 There are many more online, including cartograms where not the size of the population, but other variables are represented. Russia’s land area is 17,098,246 square kilometers and the world has a land area of 148,940,000 square kilometers.Bangladesh has an area of 130,168 square kilometers, Florida has a land area of 170,305 km².Source of the data on land area. Calculated based on this data here. This is the estimate of the US Census (here) and also see Wikipedia here. The area of Rwanda is 26,338 km² and Burundi 27,830 km². Russia and Turkey, two populous countries, are partly European and partly Asian. Here I have counted the 110 million of the Russian population and 11.2 million of the Turkish population as European, in line with the estimates here. The Chinese GDP per capita in 2016 (latest available data) was 6,894 US-$ and in India 1,861 US-$. In Germany the GDP per capita was 45,552 US-$ and in Sweden 56,319 US-$. All data are here.